If you can afford it, I recommend having a couple of different setups to paint with. I like to paint from 4”x6” up to 36”x48” outdoors. There is no single system that is the perfect easel or Pochade box and that is why I have different equipment for traveling as light as possible. The recent popularity of outdoor painting has made buying equipment more affordable. Whatever your preferred medium—whether it is watercolor, pastels or oil painting—there are great solutions for your outdoor painting needs. 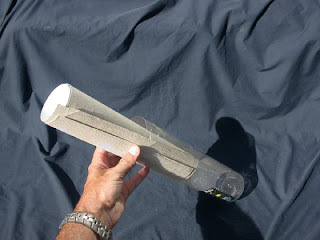 There are many fine Pochade systems on the market to fit your budget. Painting getaways are a great way to renew the spark of creativity. When I travel to a painting spot for a week to ten days, I streamline my painting setup. Flying can be hard on painters with all the restrictions. I often ship my supplies and equipment ahead of me. I prefer FedEx. They are very reliable. As an oil painter carrying solvents on a plane are out of the question. With the new security regulations paints are no longer allowed as part of your carry-on items. For checked luggage I switch to water based oils or watercolors for the trip. A collapsible brush holder works great for cleaning brushes. I limit the size of my sketches to 12 x 16 or smaller. I cut a number of pieces of oil primed linen to size and only bring one board to clip or tape my paintings to saving on weight and space. My collapsible brush holder slides under the panel in my Pochade box. I roll up my linen and place it in a clear mailing tube. When paintings are finished and dry I roll them up and replace them in the tube. All my brushes, clips and paints go into the tube also. I do this to make it easy for inspection at the airport. The mailing tube and Pochade go into a high impact plastic briefcase. A pistol case is perfect for this. You can buy thin rolls of foam rubber to line the inside with to cushion the equipment. Below are the vendors I used to purchase the equipment for this article. Golden Acrylics makes a line of slow drying acrylics called Open. They are not quite the same as oils but might be a solution for some people. Paint, turpentine and other art supplies including the collapsible brushwasher can be purchased from an art store. 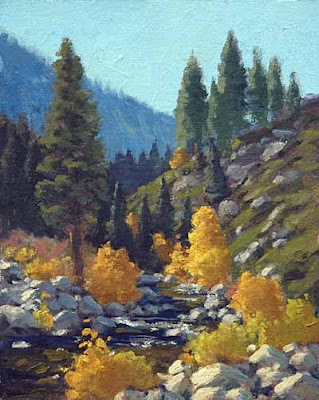 I use Gamblin Oils and Gamsol Odorless turpentine by Gamblin when I am painting with regular oil paints. I buy my linen panels and panel blanks from SourceTek. JoAnne will be happy to help you. Pochade boxes come in many sizes and configurations. These vendors make quality products. Talk to them first to see if they will satisfy your specific painting needs and budget. The Pochade vendors and Sourcetek also offer wet panel carriers as part of their product line. The plastic totes are available from stores like Home Depot, Sam’s Club, Walmart and Orchard Supply Hardware. The 35 gallon tote I purchased cost about 8 dollars. 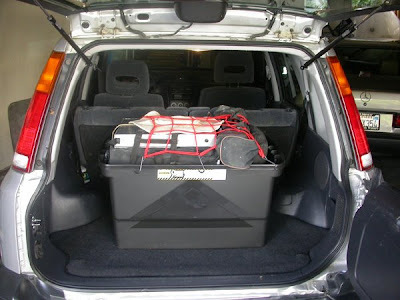 Automobile trips usually allow for more gear and a better variety of panel options. I like to keep a plastic tote box in the back of my CRV. 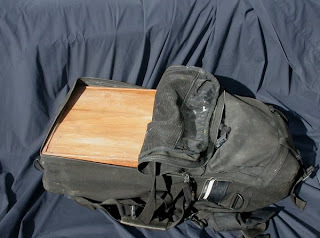 In this box goes all of my gear with wet panel carriers, turpentine and extra clothing in case of changes in the weather. 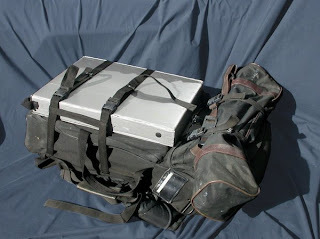 I use a lagre backpack to carry my gear in the field. The bottom compartment has my brush washer, garbage bags, paper towels, bug repellant and sunscreen. The Pochade box with all my paints and brushes go into the top compartment of the pack. This setup allows me to hike for miles if need be with up to ten panels and all of my painting gear. The tripod and lightweight wet panel carrier strap to the outside of the pack. Total weight about thirty-five lbs. In the car the tote has everything I might need but I don’t want to carry with me into the field. 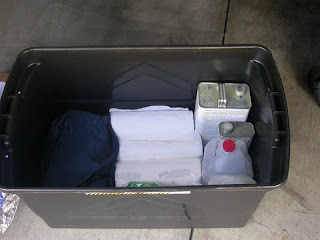 The bottom of the tote box has extra clothing for extreme weather, paper towels, water and turpentine. I also have a wet panel box to put my finished paintings in. My backpack goes on top of my other supplies and I secure it with cargo netting. Using cargo netting over the top of the tote I can pack things higher than with the lid on and still have them secure. The plastic tote helps keep everything together and keeps me from getting paint all over the car. I paint from 4 x 6 up to 36 x 48 outdoors. 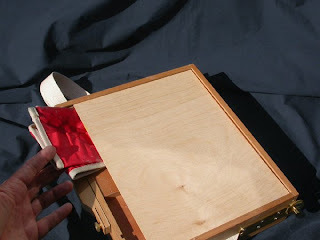 There is no single system that is the perfect easel or Pochade box. That’s why I have different equipment for traveling as light as possible. The recent popularity of outdoor painting has made equipment more affordable. Whatever your preferred medium—whether it is watercolor, pastels, acrylic or oil painting—there are great solutions for your outdoor painting needs. 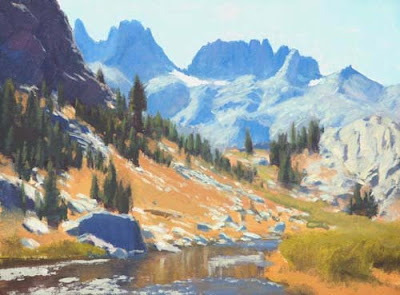 I originally published this article on www.OutdoorPainting.com five years ago. I have updated it with current information for today’s air travel restrictions. Painting trips are a great way to renew the spark of creativity. When I travel to a painting spot for a week to ten days, I streamline my painting setup. I make sure I get all my equipment and clothes in my carry-on luggage. This minimizes loss and or damage to my painting gear. If carrying on your luggage is not an option, I recommend shipping it to the destination in advance. Airlines will not be responsible for damages to your expensive gear in checked luggage. Solvents are prohibited on planes. I usually switch to water-based oils, acrylics or watercolors for my trips, unless I’ve got a contact at my destination who will supply my Gamsol. 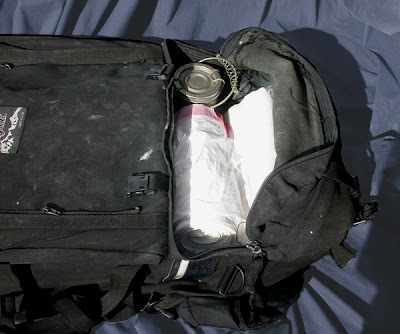 The new TSA rules allow liquid containers 3.4 ounces or less when placed in a clear zip-top quart-sized bag. A normal 37 ml tube is equal to 1.25 ounces. Large tubes of paint are more than 3.4 ounces, so remember to swap your big tube of white paint for a 37 ml tube. Otherwise the TSA will dispose of it. 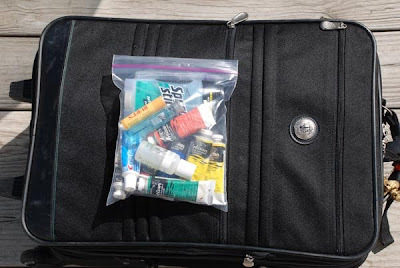 Remember, this quart bag must contain all your liquids, not just your paints, so leave room for bug spray, hand cream, toothpaste, and deodorant. Also, do not bring a paint scraper as the TSA does not allow sharp objects on planes anymore. A collapsible brush holder works great for cleaning brushes. If it starts to leak, just place a Ziploc in it to hold the water. I limit the size of my sketches to 12 x 16 or smaller when I fly. I cut a number of pieces of oil primed linen to size and only bring one board to clip my paintings onto, saving on weight and space. I use clips, rather than tape, because weather can make the adhesive on tape unreliable. 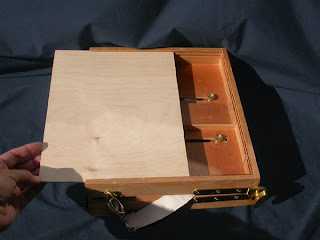 I place the blank panel in the Pochade box. I roll my linen and place it in a clear mailing tube. 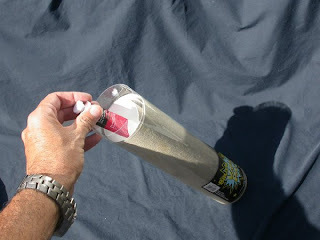 When paintings are finished and dry, I roll them and replace them in the tube. All my brushes and clips go into the tube also. I do this to make it easy for inspection at the airport. 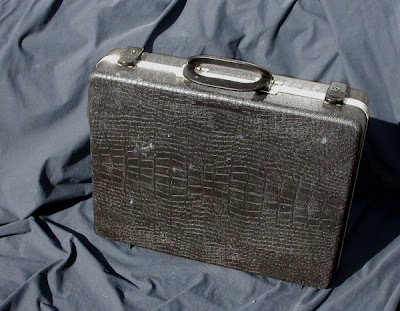 The mailing tube and Pochade go into a high impact plastic briefcase. A pistol case is perfect for this. You can buy thin rolls of foam rubber to line the inside of the case to cushion the equipment. In my small luggage bag, I place all my clothes, toiletries, cell phone, camera and tripod. 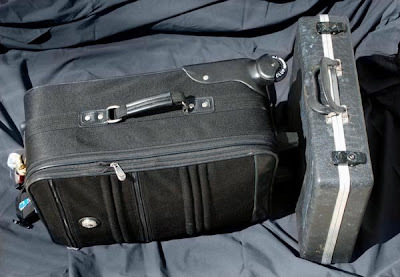 Airlines allow one briefcase and one small piece of luggage as carry-on items. I’m ready to go. Below are the vendors I used to purchase the equipment for this article. Please mention my name when purchasing from vendors. AcrylicsGolden Acrylics makes a line of slow drying acrylics called Open. They are not quite the same as oils, but might be a solution for some people. 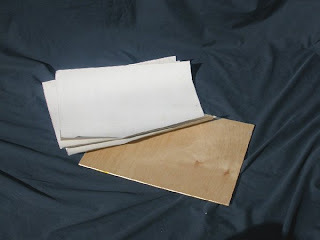 I buy my linen panels and panel blanks from SourceTek. Pochade BoxesPochade boxes come in many sizes and configurations. The following vendors make quality products. It’s best to speak with them to see if their products will satisfy your specific painting needs and budget. Wet panel carriers are as varied as Pochade boxes. The Pochade vendors and Sourcetek offer wet panel carriers as part of their product line. A lightweight panel carrier is made by Raymar. Extreme weather gear, clothing, backpacks and pistol cases can be purchased from a local sporting goods store or from an online store, such as Cabela’s. The plastic totes are available from Home Depot, Sam’s Club, Walmart, Target, etc. The 35 gallon tote I purchased cost about 8 dollars. I keep my gear in a backpack. I find the after market packs are better than the ones from the pochade companies but do your research and find a pack that is comfortable for you with all your gear in it. The bottom compartment of the pack has my brush washer, garbage bags paper towels bug repellant and sunscreen. The Pochade box with all my paints and brushes go into the top compartment of the pack. The tripod and lightweight wet panel carrier strap to the outside of the pack. This setup allows me to hike for miles if need be with up to ten panels and all of my painting gear. The bottom of the tote box has extra clothing for extreme weather, paper towels, water and turpentine. I also have a wet panel box to put my finished paintings in. My backpack goes on top of my other supplies and I secure it with cargo netting. 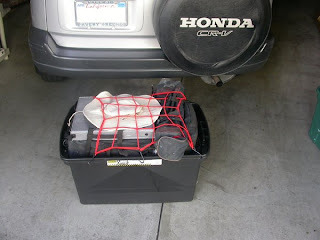 Using cargo netting over the top of the tote I can pack things higher than with the lid on and still have them secure. The plastic tote helps keep everything together and keeps me from getting paint all over the car. Painting is hard enough without having to suffer the handicap of poor tools. This is not limited to just brushes and easels. I know it’s hard to spend money on art supplies when you first start to paint. When I first began, my rule of thumb was to buy the best I could afford at the time. Even when I was poor, the things I wouldn’t skimp on were brushes, paint, and solvent. Familiarize yourself with the different type of brushes for your chosen medium and style of painting. Go to art stores. Look at brushes. Try the different shapes and types of synthetic and natural brushes available. Check out prices. I personally use flat hog bristle brushes in sizes 4 to 18. I like the Robert Simmons Signet brand. Always use artist grade paint. Beyond that, brands of paint are a personal choice; so again, try different brands of artist grade paints to find what you like. For me, there is only one choice for solvent and that is odorless mineral spirits. All solvents clean your brushes. You want the safest nontoxic material you can afford. There is no perfect outdoor rig for all your painting needs—no matter what the manufacturers claim. I have several to fit my requirements. For the studio, I want a large steady easel that will hold all the different canvas sizes I paint. In the field, I desire the smallest and lightest setup I can have without sacrificing stability. I use two different companies for pochade boxes. These boxes are well made and are at a good price point. They have models with built in panel carriers and lighter weight models without the carrier feature. They come with a tripod and backpack in various sizes. 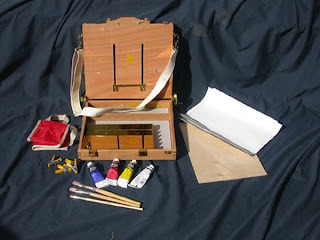 This company makes a quality box also; it is a little lighter than the Artwork Essentials box and a lot more expensive. They do not come with tripods or accessories, but you can purchase these separately. 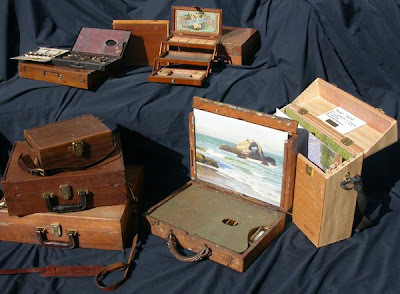 You can get them in wooden cases and custom airtight pelican cases for air travel. Both companies offer various panel carriers for your wet panels. Check their websites for more information. I don’t recommend the other pochades on the market. In my years of teaching, I’ve seen all of them come through my classes and they are either too heavy, poorly designed or so complex that something is always popping off or breaking. Trust me on this. I know what I’m talking about. I was in the Sierras with some artist friends last year and they had upgraded to Carbon Fiber tripods which run about a thousand bucks for a good one with a swivel head. I had tripod envy for weeks. Gitzo and Feisel make the best ones for carbon fiber. As for easels, there is only one studio easel for me and that is a Hughes easel. I have a double masted model; they are built to order and are worth every penny. 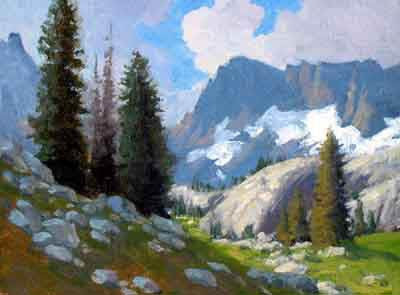 When I’m painting large canvases outdoors, I use a Take-It-Easel—which is a better version of the cheap Gloucester easels made fifty years ago. Instead of cheap pine and pot metal, they are made of brass and maple wood. I still have an old Julian French easel. 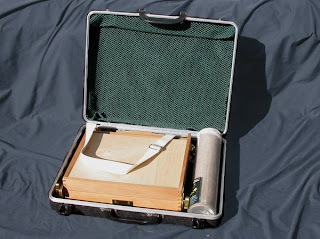 It was the first outdoor easel I bought and it is very well made. They have different and cheaper models now, but the top of the line ones are a great piece of equipment that has stood the test of time. I replaced the handle with a good leather one. I had it installed at a luggage/shoe repair shop for about ten dollars. Outdoors, I have switched to a plastic palette because of weight issues. I have the plastic cut to fit whatever pochade rig I’m using. Every year or so I replace the plastic, it is not permanent and scratches easily, but the weight and added safety is worth the inconvenience for me. For the easel palettes, I use a folding wood palette box called, unfortunately, a French Mistress; it comes in two sizes 12 x 16 and 16 x 20. I like the smaller one. I place two hooks on the inside front so I can attach a plastic bag for garbage. I also have a bungee cord I use to secure it to either easel. In my early painting days, I used cotton duck canvas panels and framed canvas. I slowly switched to double oil primed linen, first for my outdoor work and then my larger studio pieces. Whether you make your panels and stretch your own canvases or buy them from a manufacturer, make sure the surface you paint on is archival. There are many types of surfaces available to paint on. Once again, the surface you use is a matter of personal preference. I think making panels is cathartic and I like taking the time to do it. I buy my blank birch panels in 12 x 16 and smaller sizes from SourceTek panels. I use glue called Miracle Muck, which I also buy from SourceTek.